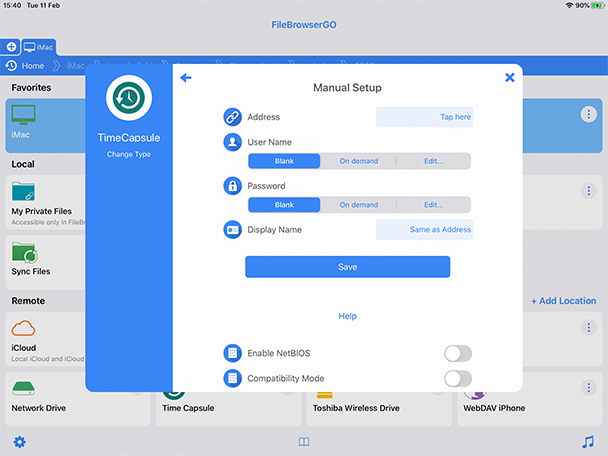 These details apply to TimeCapsule and to AirportExtreme devices with attached USB hard drives - where 'TimeCapsule' is mentioned below, if you have an AirportExtreme, the same applies. When you launch the AirPort Utility you should see a screen like this. If your screen looks different click here. Select the "Internet" tab to reveal the next page. 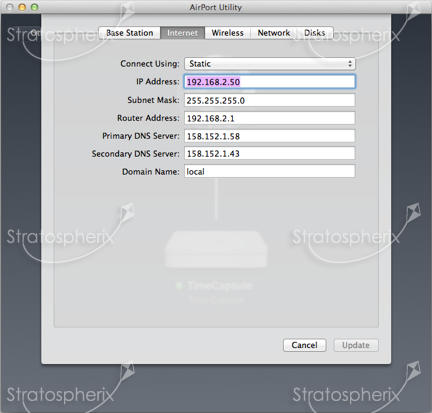 The 'Domain Name' forms the second part of the network name and must be appended to the 'Base Station Name' in this example the full network name is "TimeCapsule.local". Enter this into FileBrowser's "Address" field. If you cannot connect we suggest you try using the 'IP address' instead. This is 192.168.2.50 in this example. Select the "Disks" tab at the top of the utility. Ensure that "Enable file sharing" is ticked. Choose from the "Secure Shared Disks" drop down list. FileBrowser supports all 3 modes. If you choose the "With accounts" option, the username you configure here is the same one you will need to enter into FileBrowser's Username field. For the other 2 options, you can leave FileBrowser's Username field blank and just enter the password. 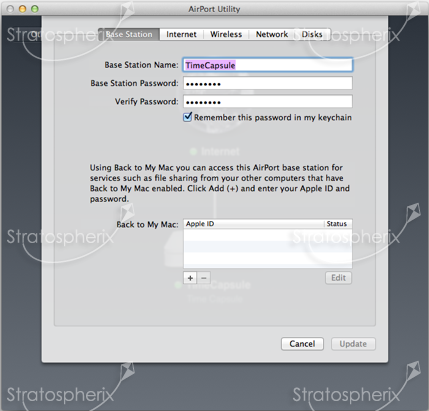 Set the Username and Password fields depending on how you configured file sharing in the 'Enable File Sharing' section above. Tap the new location to connect.